Thanks to Tyson Foods for sponsoring this post. As always, all opinions are 100% my own. Gather ‘Round the Grill and get ready for lots of flavor with this simple & delicious 4 ingredient chicken recipe! The weather is warming up, and that means that grilling season is upon us. My husband loves to grill – so much that we have a charcoal grill and a propane grill out on our patio. We don’t have a lot of space, but we have a cozy little setup for dining al fresco that we try to utilize whenever the weather is nice. It’s a great way to spend some time outside with our family. My parents were in town recently, and we knew we’d be firing up the grill at least once during their visit. It’s always fun to hang out and catch up while dinner is cooking a few feet away from us. Plus, who doesn’t love grilled chicken? So on our way back from a long afternoon upstate, I asked my husband if he’d stop at Walmart so I could pick up all of the ingredients we needed to make dinner on the grill later. I knew I wanted to make a simple yet delicious meal for my parents, and this recipe using Tyson® Fresh Boneless Skinless Chicken Thighs (as well as some bone-in, skin-on thighs) was something I knew even the picky eaters everyone in my family would love. Shopping for the ingredients was actually pretty funny. My husband dropped me off at the door since I was on crutches, and my dad helped me get into one of those little motorized shopping carts (maaaaaan, those things are fast!). I zipped around the store, chasing him through the aisles until we made it to the grocery section. We definitely got some funny looks from the other shoppers. I was able to get everything I needed for this recipe and got a great value at Walmart. It’s not somewhere I usually shop, but it was super convenient that day. Plus I got to spend time with my dad while my son (and husband!) napped in the car. Talk about a win/win! Once we got home, I put the marinade together and got to work on a big ol’ side salad to go with the chicken. The chicken only took an hour to marinate, so everyone got to hang out on the patio chatting and drawing with sidewalk chalk while my husband prepped the grill. The weather was beautiful and everyone had a good time. I thought a nice big family style presentation would be good for the grilled chicken, so I dug out the biggest platter in the house. I laid out a bed of baby spinach on half of it and topped it with hard boiled eggs, tomatoes, red onions, roasted beets and cheddar cheese. Once the chicken came off the grill, I arranged it on the other half of the platter, and dinner was ready! I had some Asian Slaw, Potato Salad with Mustard + Dill and grilled corn on the cob leftover from dinner a few days before that, which made for a delicious, low maintenance addition to our dinner spread. I love how grilling gets the whole family involved in making dinner. The chicken was a hit with all 5 of us. My 3-year-old took one bite and said, “this chicken is DELICIOUS!”, which is high praise coming from a finicky toddler. 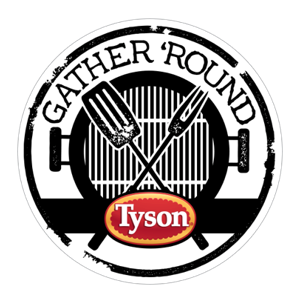 Thanks again to Tyson Foods for sponsoring this post and inspiring me and my family to gather ’round the grill. Make sure to stay tuned later this month for another delicious, grilled chicken recipe! Fire up the grill and get ready for lots of flavor with this 4 ingredient chicken recipe! In a bowl, mix the seasoning mix together with the chicken broth and mustard until smooth. Place chicken pieces in a Glad® Food Storage Zipper Bag with seasoning mixture. Seal the bag and marinate for 1 hour. Remove the chicken from the bag and discard the marinade. Grill the chicken about 10 to 12 minutes on each side or until juices run clear. ** Remove the chicken from the grill and let stand covered for 5 minutes before serving. *Recipe only gluten free when made with all gluten free ingredients. Read labels of all packaged ingredients to determine whether they contain gluten. **Chicken should be cooked until it reaches an internal temperature of 170°F. This is a sponsored conversation written by me on behalf of Tyson Foods Inc. The opinions and text are all mine.